What could possibly make Ambrosia apples more delicious? How about cloaking them in bacon and giving them a slight spicy chipotle bite! This recipe is fantastic as an appetizer (watch them go) or as an addition to brunch. And, if you’ve got guests or family members following a Paleo diet, these are good for them too. There are a couple of variations you can do to this recipe. If you’re not a fan of spicy food, skip the chipotle coating or replace it with cinnamon. And, if you’re serving this for brunch and you’ve got a sweet tooth – try dipping them in maple syrup! Want to make a meal with them? Serve them with an arugula and kale salad. However you dish them up, we think you’ll find that the saltiness of the bacon, the spiciness of the chipotle and the sweetness of Ambrosia apples delivers the kind of flavour explosion that will have you reaching for ‘just one more’ time and time again. Like we said, these are sure to be the first bare plate at your next gathering. Oh, and did we mention these are super easy? Here’s how to make them. Cut bacon strips in half (width-wise) so you have enough bacon to easily wrap around the apple chunks. Cut Ambrosia apples into 1″ chunks (skins on). 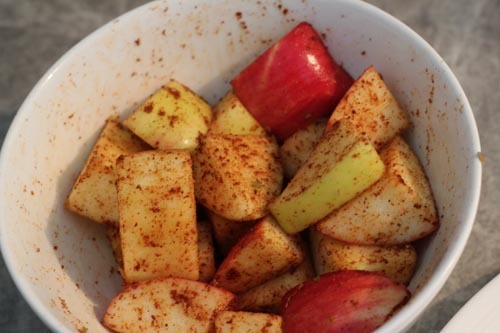 Sprinkle chipotle over apples and toss until the apples are evenly coated with spice. Add more or less depending on your love of spicy foods! 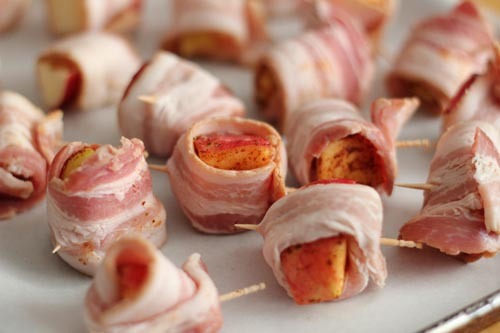 Wrap bacon around apple chunks and secure with a toothpick. 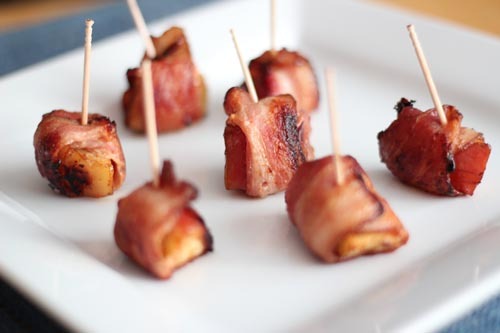 Place bacon-Ambrosia bundles on a parchment paper lined baking sheet, seam-side down. *Tip: it’s best to use a baking sheet that has side walls so the bacon fat doesn’t drip off into your oven. Bake for 20-30 minutes or until the bacon is as crispy as you like it. If you love this recipe, or your tried a variation, we’d love to hear from you. Share your experience with us on Facebook, pictures of your bites on Instagram or Pinterest, or just hit return and send us an email. Move over Hawaiian pizza, there’s a new meat and fruit pizza combo in town. Why do we Give Teachers Apples?